Quick trip in the windy part of October. Got sister and BIL in town for their first time to the Keys. First day we picked up my new bait catchin machine. Next day was windy again so we did the Key West thing. Again another windy day so we took a long boat ride and did some snorkeling. 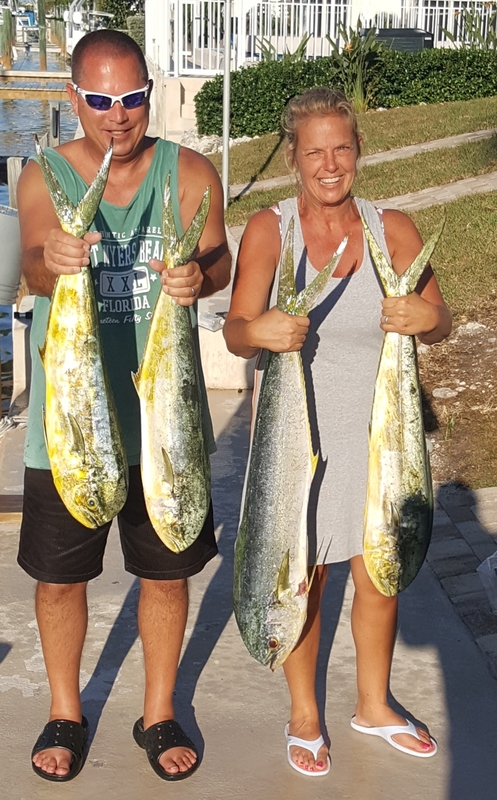 Finally get a decent day for a couple that has never be offshore fishing. Plan was to head for the humps and look for weedlines on the way. Only found some scattered lines but trolled them anyway. Picked up a couple phins around 20-22” so they went back to get bigger. On to the humps where we set up the spread with small feathers way back. 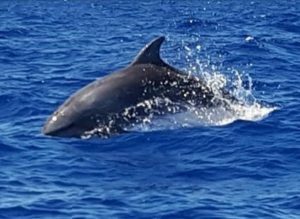 We had this type of dolphin all over the place. You had to get your catch in the boat very quickly or lose it to the porpoise. 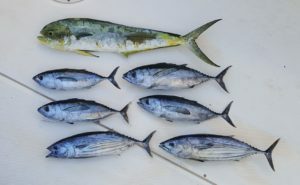 We made a couple rounds with constant action and picked up some small tunas. Next we head to deeper water in search of thicker mats. Out to 2000 and none in site so we turn and head north. 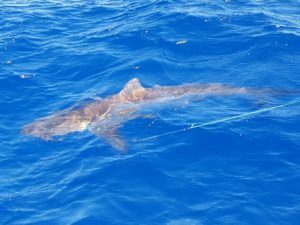 On the way in we come across a big floater and on the first pass we are hooked up with another small dolphin. It met my 24” min so into the box it went. Got a late start on this half day trip but good action for their first time offshore. Good seas in the afternoon and great eats in the box. Got a ¾ day and start out at the humps. First pass with feathers way back and in no time the left rod is screaming. Got other lines cleared and turn to chase since we already lost half the spool. 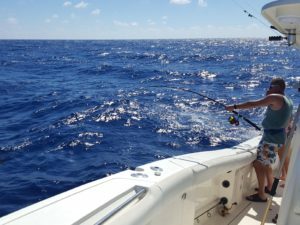 After getting some of the line back and we start using the drag to tire the fish. 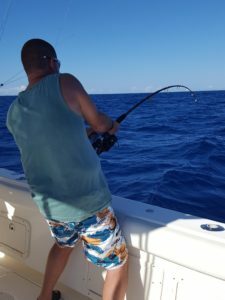 This is a big fish and at first I thought it was a shark but after 1 hour of fighting and not getting cut off there was the chance it might be a big yellow fin. Two hours into the fight and we finally are making some ground getting down to the last 100 yards. Slowly gaining line and finally color… A shark but it was a 10’ fish for someone who has only caught bluegills and catfish. With some sore arms we make a change and head out to look for some weedlines. Stop at a scattered line with a bird working. Put out a couple feathers, a hoo and a jet head on wire. 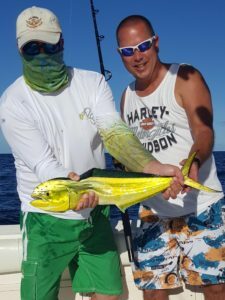 It doesn’t take long and we have one on – a nice gaffer mahi. 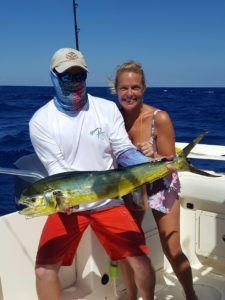 We work this line and a couple others in about 1000’ and catch several mahi and one BFT. We keep 5 mahi and 1 BFT. If was a great day of catching for some newbies to saltwater.